Lose The Fat, Build The Physique, With Total Body Conditioning! Although diet is an enormous part of the equation, physical activity helps us to burn excess calories which aids in our journey towards fat loss. Learn how to get maximum results from combining all diet and workout techniques together! So you've made the resolutions, even written out the list of promises to yourself, and posted it on the fridge. You have started a fat loss dietary program and since 'they' say diet is 80 percent of the result, that's all you need to do right? Eat clean, watch those calories and macros and your ideal body will just appear chiseled, and tight from beneath the layers of now rapidly melting body fat ... right? Well no. Although diet is an enormous part of the equation, physical activity helps us to burn excess calories which aids in our journey towards fat loss. Strength training with body weight, machines, and free weights increases our calorie expenditure, increases our lean mass, increases our daily caloric needs, increases bone density, corrects our posture, rids us of aches and pains and gives a tight, full, well-conditioned muscles. Following a reduced calorie diet without exercise or strength training will result in a smaller body, but it will be just a smaller version of the body you have now; is that what you want? Or do you want to re-create your body, change your shape, and get the ideal physique you have always wanted? If you are in the latter category, and want a physique make over, or want to start from scratch and see what you're made of, this is the place to start! 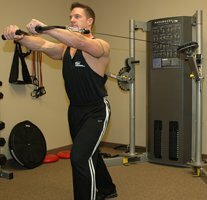 Each of the components of total fitness and conditioning will be explained, as well as how to achieve your goals within each; whether you are a beginner that has never touched a weight, or an aspiring athlete, or experienced weight lifter; one of the programs in this article will help you attain your goals! It's important to be sure to include each of these things in your strength and cardio program, to achieve total fitness and an overall well conditioned physique. Let's briefly explore each one. This is basically your ability to perform aerobic work for a sustained amount of time, without becoming incapacitated, winded or otherwise injured. This can be trained slowly to increase, where week one you may only jog a mile, but by week 4 you are easily jogging 3 miles with the same effort. In addition to being able to run easier, increasing your cardiorespiratory endurance results in physiological responses such as increase in body fat utilization, a decrease in peripheral vascular resistance, and an increase in maximal oxygen consumption- these help to decrease the risk of cardiovascular disease by favorably modifying risk factors like obesity, hypertension and elevated triglycerides. This is the most important aspect of your strength training regimen. This refers to the muscles ability to produce force and perform work. The muscles should be trained a minimum of two times per week, in a program of progressively increasing resistance, to failure, to see optimal conditioning. The rule of thumb is 24 reps or less for an exercise is best suited to hypertrophy (muscle growth) and strength gain; going beyond 24 reps total for an exercise will achieve muscle endurance. Depending on your specific goals for your body, your repetition plan will vary and should be alternated occasionally. This is a component that is often overlooked or avoided altogether. Flexibility is a joints ability to move freely through a full range of motion (ROM). Within each joint and for each activity there is an optimal ROM for peak performance. Depending on the activity, the optimal ROM varies. A number of factors can limit joint mobility and ROM; and these factors can greatly hinder a fitness program or halt it altogether if one becomes injured; which has been proven to occur more readily when muscles are stiff and tight. Flexibility training minimizes these factors that limit flexibility in order to balance muscle groups that might be overused during strength training, cardio sessions, or as a result of poor posture or form. Also, it's important to remember that a joint is only as strong as the muscles that cross it. In this context, when we refer to the body composition component, we are referring to the awareness of your current level of body fat via OMRON or caliper testing; knowledge of your goal body fat percentage; and a reduction of body fat stores, and a progressive increase in lean body mass (muscle). It's important to measure your progress in body fat reduction weekly to keep yourself on the right track towards body fat loss. If you haven't exercised in more than six months, or if you have never followed a regular exercise routine, it is very important to ease into it. Begin with 30-45 minutes of low intensity aerobic exercise, 3-to-4 times a week. This can be classified as maintaining an average heart rate range (HRR) of 125-150 BPM for the duration of the work out. This can be performed on a treadmill, elliptical trainer, arc trainer, stair machine, a bike and rower or during a group exercise class such as low impact step to hi-low impact floor aerobics to start. You have been doing cardiorespiratory exercise for 3-6 months, at least twice a week; and strength training with body weight, machines or free weight at least once every week- if this sounds like you, and you want to switch up your training a bit, this is the level you are at. If your goals are endurance based, i.e. training for a marathon, sport or competition; than training for 45-60 minutes, five days per week is recommended. This should be done using a modality similar to your goal or sport. For example, if you are training for a marathon, using a combination of the treadmill and outdoor running is ideal to condition the body to do that type of work. If cycling is your sport, than performing your cardio respiratory work on a bike makes sense. A trained athlete, marathoner, snow boarder or well-conditioned weight lifter looking for a more overall approach to fitness. Runners tend to excel at their sport but are lacking in total strength, weight lifters are strong, but often neglect flexibility training. If you are an athlete or seasoned weight lifter and have been strength training three or more times per week, for longer than one year - performing moderate cardiorespiratory work at least three times per week; You should be training for cardiorespiratory endurance and fitness 5 times per week for 60 minutes, using the modality similar to your lifestyle or sport. This training should be progressive in nature, either increasing pace or mileage or time, depending on your mode, every week. This is for the intermediate to advanced exerciser and is a great way to utilize slightly more fat for energy and for the time crunched, during a shorter cardio work out. It isn't for the feeble, if you do this type of cardio work, you should be going all out, full force when the high intensity cycle arrives in the work out- going about it 'half-assed' will not result in the full benefits that a true high intensity interval work out can provide. The idea is to warm up for three to five minutes on a treadmill at a normal, easy pace. Accelerate to a brisk walk, then a jog and then a full-out sprint - as fast as you can tolerate - for timed cycles; and these are repeated usually for a total of about 25 minutes, including warm-up and cool-down periods. I have outlined an example of high intensity interval training below using a treadmill at 1 percent incline. Determine your level of fitness from the descriptions above, and select a work out that suits your needs from the one's listed below. If you are a beginner, you can work out 1-2 times per week for strength. Perform a 5-minute warm up on any cardio machine. For each of the exercise in this program, perform Two sets of 15-20 repetitions, done slowly and with controlled motion. Maintain good posture throughout the exercise with shoulder blades retracted and depressed, good stability through the abdominal complex, and neutral spine angles. Activate core with proper drawing in and pelvic floor contraction. While maintaining total body alignment, step forward descending slowly by bending at the hips, knees and ankles, keep most of your weight in the forward leg and AVOID letting your back knee touch the ground. During the descend into your lunge, a partner will pass you a medicine ball from the side of your body. Catch the med. ball , rotate away from your partner toward your lunge leg. Use your hip and thigh muscles to push yourself up and simultaneously rotate back toward your partner throwing the med ball back at them. Lunge - W / MB Rotational Throw & Catch. Perform 2 sets of 15 reps with a controlled tempo. Rest for 60 seconds between sets. Maintain good posture throughout the exercise with shoulder blades retracted and depressed, good stability through the abdominal complex and neutral spine angles. 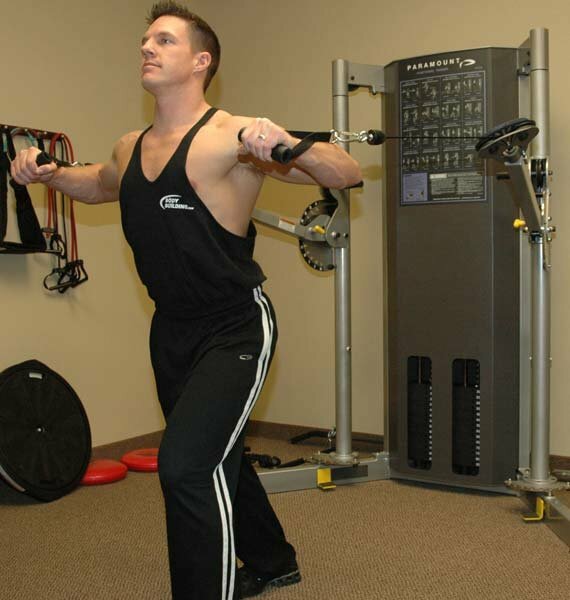 This exercise integrates upper and lower body and will cause fatigue; technique should be maintained through each repetition. Stand on one leg with good alignment, the knee is bent to approx. 20 degrees. SLOWLY flex forward in the trunk and allow the raised leg to extend behind you in triple extension (at hip, knee and ankle) and HOLD THIS POSITION. The body line should be straight and parallel with the floor from the cervical spine right down the extended leg (as shown in the video link). Choose LIGHT weight and PERFECT the technique as this exercise is difficult to perform correctly. 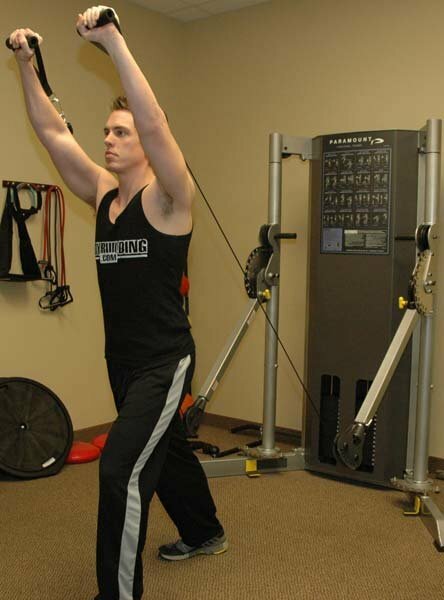 Allow the arms to hang straight down to the floor, perpendicular with the body and floor. Perform a rear delt fly, keeping the palms facing the ground, and lower the weight SLOWLY. Rear Delt - Stork Stance. Begin holding the dumbbells (palms facing chest). Step forward onto a platform (4-to-8 inches in height). Bring up the other foot and hold at a 90-degree angle while you maintain abdominal draw-in. Multi-Planer Step Press - Front. Perform 2 sets of 20 reps with a controlled tempo. Begin standing on both legs in good postural alignment, with weight in hands. Draw your navel toward your spine and squeeze your glutes for spinal stabilization. Raise your arms keeping thumbs up at a 45-degree angle. Do not allow your head to 'jut' forward as you raise the dumbbells. Maintain optimal spinal alignment throughout movement. Stabilize with 1 leg off the ground. Draw your navel towards your spine and squeeze your glutes for spinal stabilization. 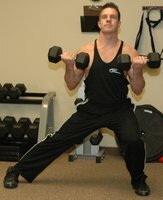 Scapation - Standing With Dumbbell (1 Leg). Perform 2 sets of 15 reps with a controlled tempo. Initiate the core with proper drawing in maneuver and pelvic floor contraction. Raise one foot off the floor approximately 2 inches and keep parallel to other foot. Lean forward (avoid rounding the back) and hold. Start with arms straight, shoulders flexed slightly above head and palms facing the floor. Perform an arc movement with full external rotation of hands as the arms travel towards your hips. Ensure that the shoulder blades are retracted and depressed. Arc back to the starting position. Ensure the chin is tucked into the chest for good cervical alignment. Cobra - Standing On 1 Leg With Dumbbell In Alternate Arm. Perform 2 sets of 20 reps with a controlled tempo. Rest for 60 seconds between sets. Sitting on SB holding med ball ( weight relative 5-10% of max strength in this area) draw in navel towards spine and squeeze glutes. Slowly walk out both feet and lean back onto SB, allowing head and shoulders to rest on ball. With core activated lift hips up level with shoulders and knees-bridge position and maintain. With the MB overhead, slowly extend the arms up to a position perpendicular to the ground (as shown). Slowly lower with the arms straight so that the arms are parallel with the ground (as shown). 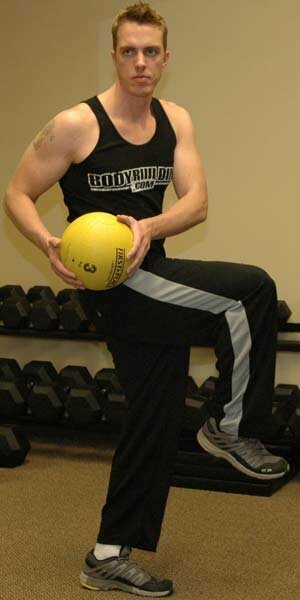 Pullover - On Exercise Ball & Holding A Medicine Ball. Stand in a stable staggered stance position. Using a barbell grip, align the wrist and elbows as shown for start position. Maintaining proper posture, start movement by pressing hands together. It is important not to let your back arch at any time during the movement. Keep arm in alignment with the cable as shown. Keep feet flat on the floor and slight bend in knees to maintain balance and stability. Try various grip positions, Alternating arms. 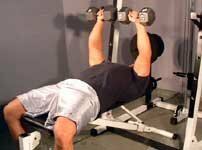 Chest Press - Standing (Free Motion). Start by lying face down on the ball. 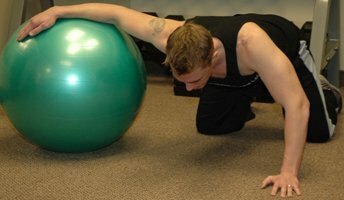 Slowly roll forward leaving shins on the ball and place hands in a comfortable position on the floor. Lift your hips up until they are in line with your knees and shoulders. Brace the spine by contracting the abdominal wall. 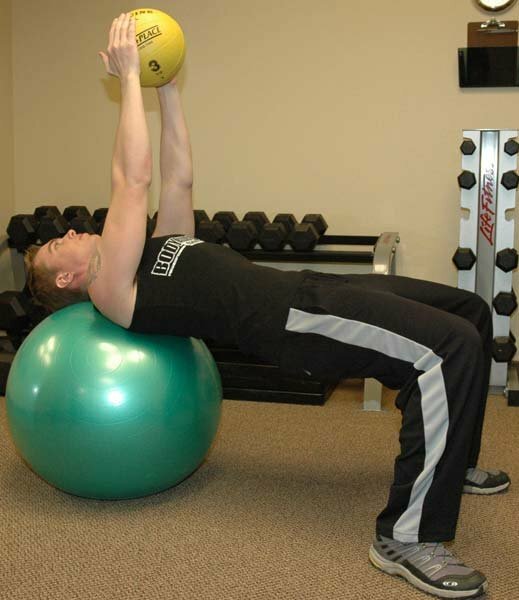 Squeeze the glutes and place the hands shoulder width apart on the stability ball. Perform push-up while maintaining back stability (do not allow low back to sag). 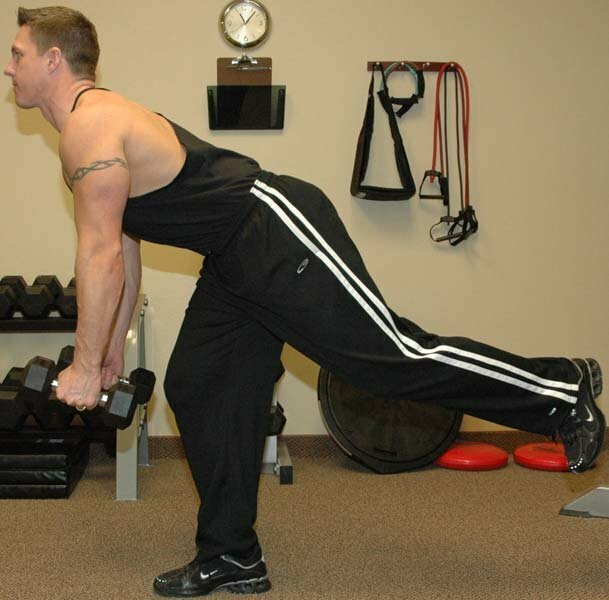 Perform repetitions SLOWLY (4-2-2) to enhance stabilization strength. Only move as far as you can maintain balance and core stability. Do not allow knees to "jet" forward. The pelvis should remain stable throughout the entire exercise. Maintain glute activity throughout the entire exercise. Push Up - Hands On Exercise Ball. 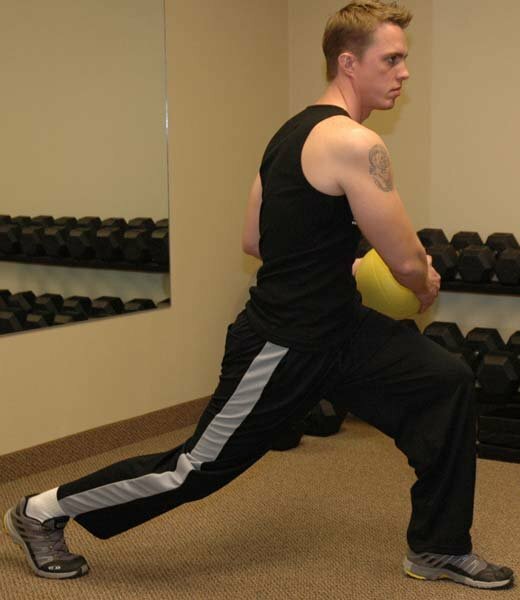 In the deepest part of the lunge, flex the trunk forward and perform a kickback motion for the triceps. Bring the weighs back down slowly, extend the trunk back to upright aligned position. Use your hip and thigh muscles to push yourself up and back to the starting position. 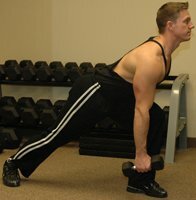 Lunge - Forward W/ Triceps Extension. Maintain good posture throughout the exercise with shoulder blades. retracted and depressed, good stability through the abdominal complex, and neutral spine angles. While maintaining total body alignment, step sideways descending slowly by bending the lunge at the hips, knees and ankles, and keeping the other leg straight in extension. Keep most of your weight in the lunge leg and AVOID letting your back arch as you descend into the lunge. 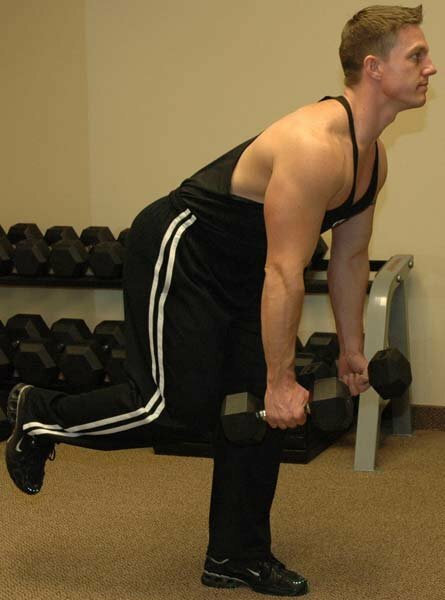 In the deepest part of the lunge, perform a bicep curl and lower the weight slowly. Other progression: 1- inertia progression: for dumbbells, to cable, to tubing 2- Stable to Unstable: shoes on to shoes off to lunging onto an unstable surface (i.e. core-board, airex pad etc.). Lunge - Lateral W/ Bicep Curl. Warm Up: Start your warm up by foam rolling to loosen up the adhesions, then increase the tissue temperature with your favorite piece of cardio equipment for 5-10 min. Follow with active stretching. On an Elliptical for example start by performing 20-40 minutes at 60-80 percent max heartrate. 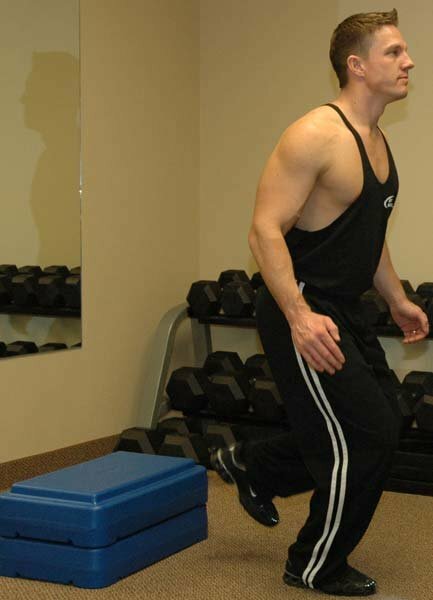 Traditional cardio could be substituted with speed ladder drills. This helps prevent any sudden pooling of blood in the veins and ensures adequate circulation to the muscles, heart and brain; as well as preventing delayed muscle stiffness, soreness and reducing any tendency toward post-exercise dizziness or fainting. Perform 10 reps at a pace of 4 seconds each. Start in a standing staggered stance. Position back leg in external rotation AND SLIGHT ADDUCTION. 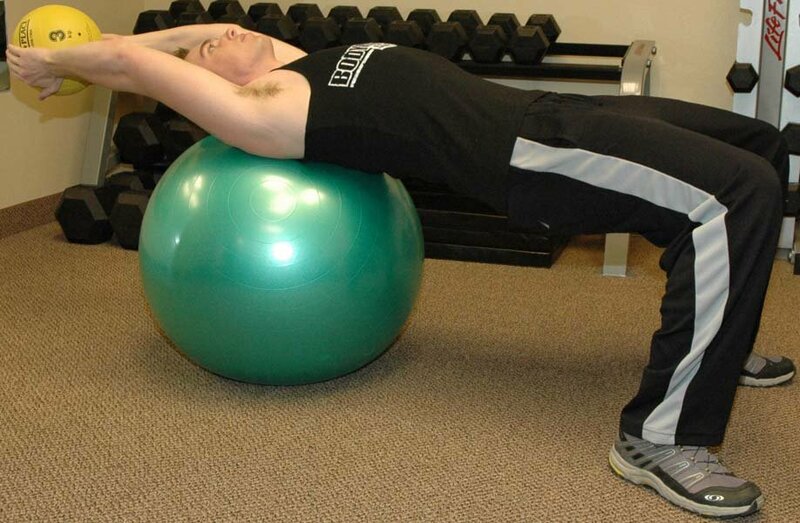 Transversus abdominus activation should be maintained prior to and throughout the stretch. While activating same side glute perform a posterior tilt (flatten back) while maintaining an erect posture. To enhance the stretch, reach same side arm up and over. It is important not to deviate forward or backward while reaching up and over. Pelvis should be "tucked under" throughout stretch (posterior pelvic tilt). Range of motion should be determined by your control. A posterior tilt, along with hip external rotation and activation of the gluteus maximus, allows for greater TFL isolation. Tensor Fascia Latae - Standing. Extend the thigh and place foam roll in the groin region with body prone on the floor. If a 'tender point' is located, stop rolling and rest on the tender point until pain decreases by 75%. Cross arms to the opposite shoulder to clear the shoulder blades across the thoracic wall. While maintaining abdominal Draw-In position, raise hips until unsupported. Stabilize the head in 'neutral'. Body is positioned prone with quadriceps on foam roll. It is very important to maintain proper Core control (abdominal Drawn-In position & tight gluteus) to prevent low back compensations. Foam roll is placed just lateral to the anterior pelvic bone (ASIS). Tensor Fascia Latae - SMR. Begin with one leg straight and the opposite leg bent. Both feet are pointed straight ahead. Next, slowly move in a sideways motion toward the bent leg until you feel a stretch in the straight leg groin area. Switch sides and repeat directions. Start in a 4-point kneeling position. Place your left forearm on the ball with your palm down and shoulder parallel to the floor. Maintaining optimal posture, allow your body to SLOWLY drop downward. Hold at first resistance barrier for 20-30 seconds, then statically contract for 5-7 seconds, relax and move into newly acquired ROM, repeat for 2-3 reps.
Lay flat on the bench with abdomen drawn in, feet flat on floor and toes pointing straight ahead. Grasp the bar with your hands slightly wider than shoulder width apart. Slowly lower the bar toward your chest by flexing elbows and retracting and depressing shoulder blades. Avoid letting the back arch and/or head jutting forward. Press the bar back up extending arms and contracting chest until elbows are fully extended. 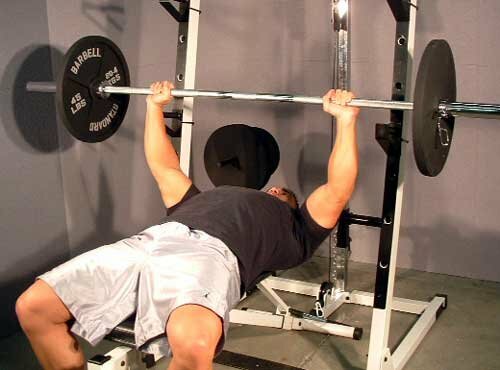 Chest Press - On Bench With Barbel. Maintaining proper posture, start movement by pressing hands together, at approx. 60-degree angle as shown. Variation: Try various grip positions, Alternating arms. 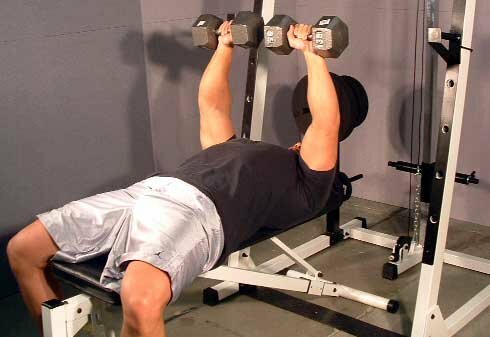 Chest Press - Overhead 2 Arm Split (Free Motion). Stand with feet shoulder width apart over the bar, flex at the hip and slightly at the knees. Take a grip width that allows the forearms to be perpendicular to the bar when the elbows are flexed at 90 degrees. Maintain neutral spine and head position. 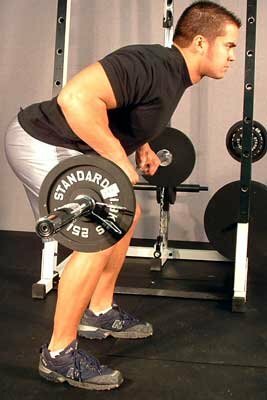 Assume a 60-45 degree bent-over position (commonly known as a functional stance). Maintaining optimal posture, pull the bar toward your chest (focus on retraction of scapulae). Focus on generating movement from your core instead of just pulling with your arms. Return to the start position and repeat movement. Lower bar at desired REP TEMPO. Row - Bent Over With Barbell. Start with arms straight extended towards the floor. 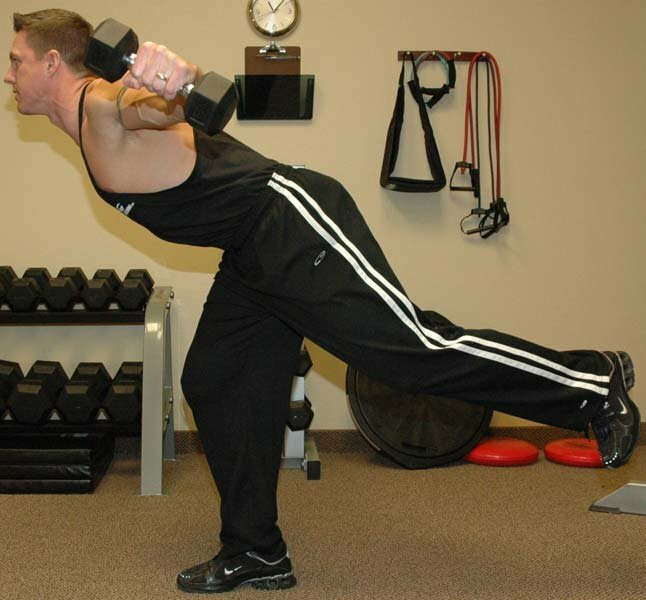 Ensure that the shoulder blades retract and depress as dumbbell moves upward. Lower slowly and allow shoulder blades to protract as arms return toward the floor into extension. 2 extremities to 1: two arm to alternating arm to one arm to one arm with rotation. Inertia progression: dumbbells to cables to tubing. Stable to unstable: shoes to no shoes to unstable surface (core board, airex pad, etc.). Start with arms straight extended toward the floor. 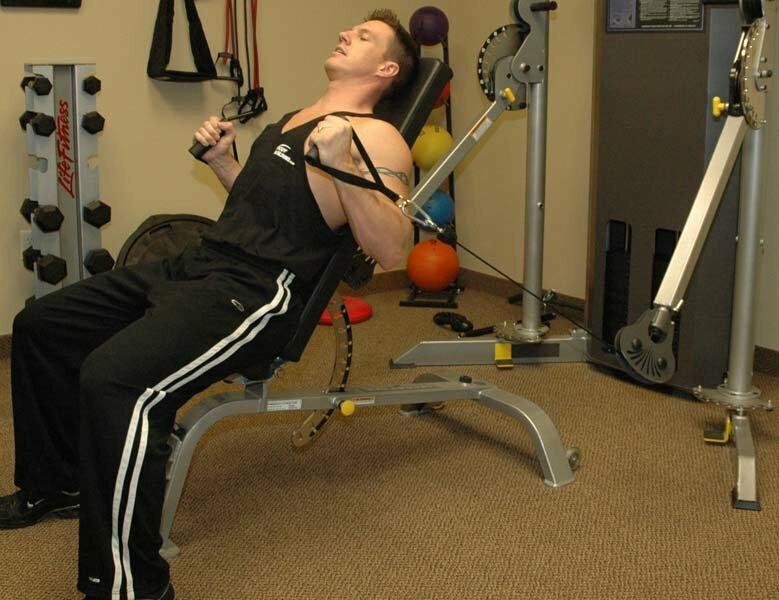 Perform a row action, alternating arms. Row - 1 Leg With DB (Alt Arm). Sit tall with back against back pad. Elbows at side below shoulders. Using a neutral grip, align the wrist and hands above the elbows. Maintaining proper posture, start movement by pressing hands straight upward above the head. Keep feet flat on the floor to maintain balance and stability. 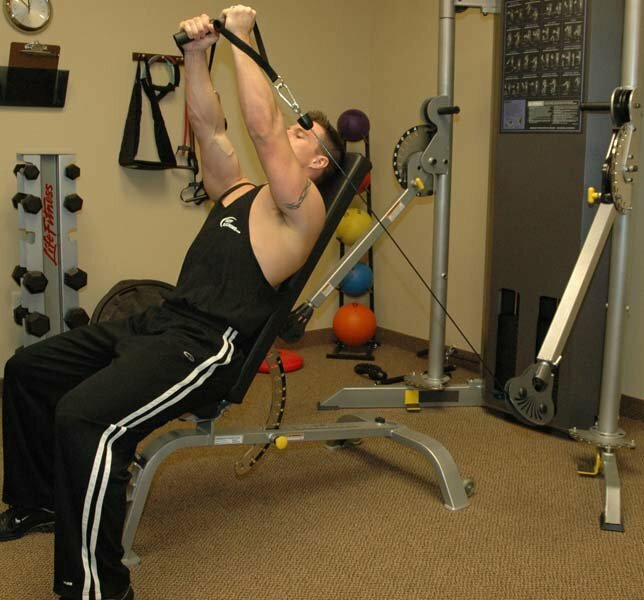 Shoulder Press - Seated Neutral Grip (Free Motion). Perform drawing in and pelvis floor contractions. Maintain good posture throughout the exercise with shoulder blades retracted and depressed, level hips, good stability through the abdominal complex and neutral spine angles. Start in a split stance, feet pointing straight ahead, knees slightly bent and dumbbells by the shoulders, palms facing forward. Perform a shoulder press to full elbow extension and return SLOWLY to starting position. Complete given reps and switch legs. Other progression - Inertia progressions: Dumbbells to cables to tubing. Perform a one arm shoulder press and simultaneously turn the shoulders toward the lead leg to full elbow extension and return SLOWLY to starting position. Ensure that the arm does NOT cross the midline of the body. 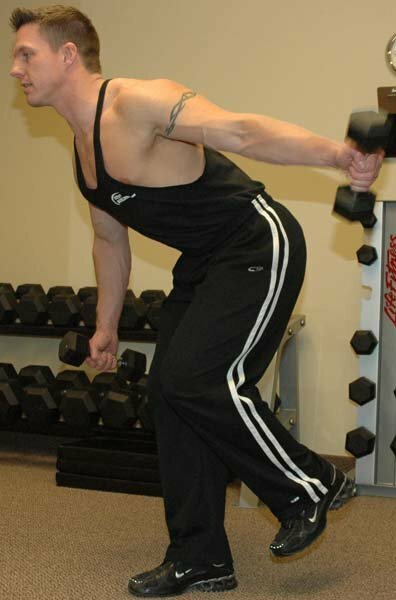 Shoulder Press - Split Stance (1 Arm With Rotation). Position the arms extended straight overhead holding a dowel rod. Maintain good posture throughout the exercise with shoulder blades retracted and depressed, feet pointing straight ahead, good stability through the abdominal complex, and neutral spine angles. Activate core with good drawing in maneuver and pelvic floor contraction. Holding the arms above the head, squat down to a depth that you can control with good alignment through the kinetic chain, squat back up. Watch for compensations at the foot (pronation, external rotation), knee (internal rotation, adduction), hip (frontal plane stability), lumbar spine (increased lumbar lordosis), upper extremity (increased flexion) and cervical spine (increased cervical lordosis). A proper stretching and strengthening protocol should be initiated if any dysfunctions exist. Squat - Overhead W/ Barbell (With Weight). Begin on top of a box with feet pointed straight ahead and knees aligned over the 2nd & 3rd toe. Jump off the box onto the ground, landing softly on the reactive point of your foot, keeping your knee over 2nd and 3rd toe and avoiding compensation throughout the kinetic chain. Hold the landing position and then repeat. Box Jump Down With 1 Leg Stabilization. Take a slightly staggered stance. Jump straight up as high as can be controlled, switch arm/leg in mid-air (such as in gait), and land in the deepest lunge as can be controlled with optimal posture. Repeat as quickly as can be controlled for desired repetitions. 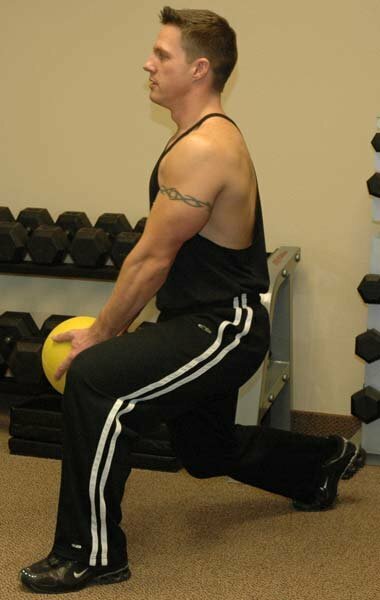 Perform exercise with side to side rotation with medicine ball. Ensure correct technique on landing and try to keep movement smooth at all times. This can be achieved by ensuring that the right leg lands same distance away from body as left leg on each movement. Initiate a thorough dynamic warm up prior to starting this exercise, this engages the nervous system. Begin this speed ladder drill by facing the length of the ladder at the side of the first run. Both feet will be moving together in this drill. Make sure you land on the toes and both feet land at the same time (foot print consistency). Start by jumping laterally into the first run, landing on both feet. Jump laterally again to the other side of the ladder. Jump diagonally the opposite direction into the second run, keep landing with two feet, continue this sequence through the entire length of the speed ladder. Perform this drill as fast as you can control. 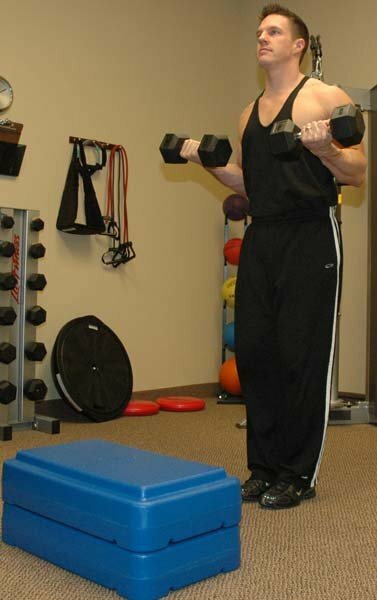 The following is an integrated program designed to develop strength for the endurance runner. The goal of this program is to strengthen the body in all three planes of motion to obtain the maximum efficiency in movement for the run. Total "communication" to all parts of the body is essential for this to happen. 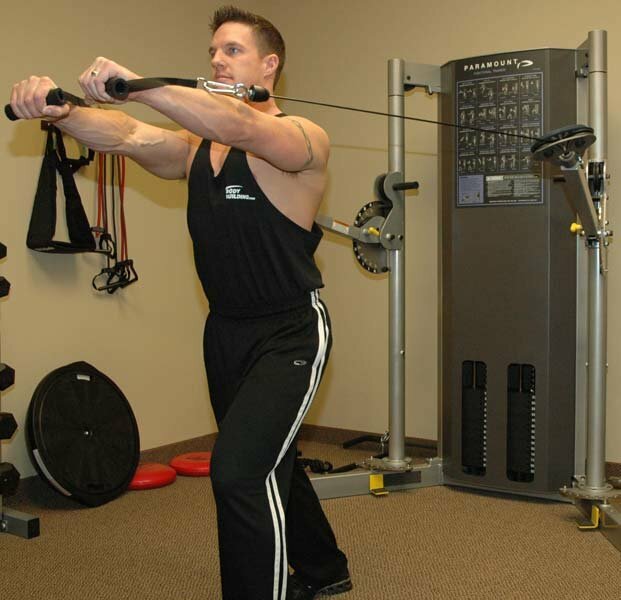 Some of the following exercises show bands being used - cables can also be used to perform the same exercises and will allow you to use more weight if required. Perform these exercises in a circuit due to the nature of the sport. Research is proving this to be the most beneficial method of improvement. Use the foam roller in your warm up to release tension in any tight muscle groups, then follow with dynamic/active stretching. It is preferable to target the areas that are used in the sport triathlon: lats/thoracic spine, hip flexors, adductors and calves. There are many specific active stretches you can use. Repeat the warm up process as your cool down - this will enable the body to function in more dynamic movement patterns. There is much scientific debate as to what type of stretching to use. Before commencing this exercise stabilize with 1 leg off the ground. Maintain a tall posture throughout the exercise and good stability through the abdominal complex. Lunge - Transverse W/ 1 Arm Row. Adaptations in this type of training include increased hypertrophy, metabolic rate and neuromuscular efficiency. Start your warm up by foam rolling to loosen up the adhesions then increase the tissue temperature with your favorite piece of cardio equipment for 5-10 min. and follow it up with active stretching. Stepper 40-85% of TH 20-60 min. 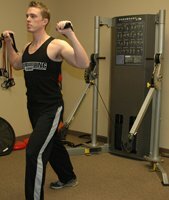 Perform cardio activity AFTER weight training. 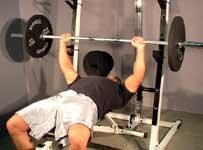 Chest Press - On Bench With DB Exercise 3 8-12 N/A 2/2/2 70-85% 60 sec. Body Weight Pull Ups Exercise 3 8-12 N/A 2/2/2 70-85% 60 sec. Military Press - Prone On SB With DB Exercise 3 8-12 N/A 2/2/2 70-85% 60 sec. 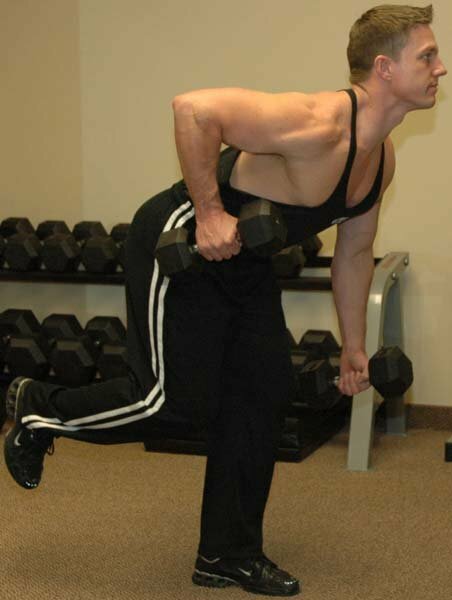 Bicep Curl - Standing Exercise 3 8-12 N/A 2/2/2 70-85% 60 sec. Tricep Extension - Standing Exercise 3 8-12 N/A 2/2/2 70-85% 60 sec. Squat - Back w/ Barbell Exercise 3 8-12 N/A 2/2/2 70-85% 60 sec. Click Here For A Printable Log Of This Workout Routine. Same as warm-up. Or based on your clients compensations Give more time/attention to those muscles SPECIFICALLY targeted during the work-out. If a 'tender point' is located, stop rolling, and rest on the tender point until pain decreases by 75%. It is very important to maintain proper Core control (abdominal Drawn-In position and tight gluteus) to prevent low back compensations. If a 'tender point' is located, stop rolling, and rest on the tender point until pain decreases by 75 percent. Stand near a wall or sturdy object. Bring one leg forward for support; use your upper body to lean against wall. Your outstretched leg should form one straight line and the subtalar joint be in a neutral position. Draw your belly button inward toward your spine. Keep rear foot on ground, with opposite hip flexed. Next, slowly move through hips creating controlled Supination/ Pronation through the lower extremity. Controllably move in and out of stretch position for recommended time. Gastroc - W/ Pronation & Supination. Start in a kneeling position as depicted. Position back leg in internal rotation. While activating same side glute perform a posterior tilt (flatten back). While maintaining the above-mentioned steps, rotate posteriorly as depicted. Pelvis should be 'tucked under' throughout stretch (posterior pelvic tilt). A posterior tilt, along with hip internal rotation and activation of the gluteus maximus, allows for proper isolation. The same directions can be utilized standing. However, the standing variation will be less effective for the rectus femoris. Flex and externally rotate shoulder/arm so that the palm faces up on the ball. Brace the spine by drawing your lower abdomen inward. Maintaining the flexed arm position, tuck your pelvis under (posterior tilt). Allow your body to slowly drop downward while maintaining pelvis position. Once you feel slight tension, hold stretch position for 20-30 seconds. Switch sides and repeat directions using opposite arm. Pelvis should be "tucked under" throughout stretch (posterior pelvic tilt). 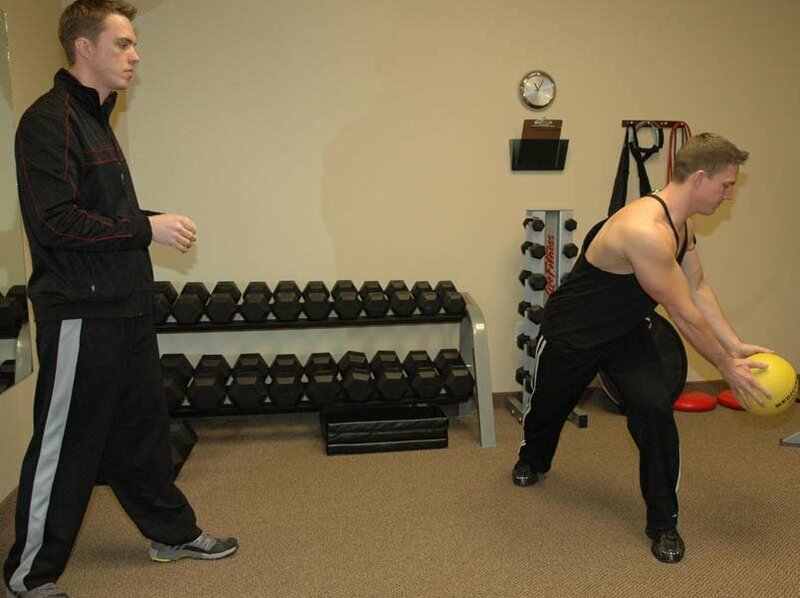 External rotation of the arm must be maintained. Lat - Prone Kneeling On SB With 2 Arms. In the optimal posture sit on the ball or bench with a minimum 90-degrees bend in the hips and knees. Tuck your chin in and controllably laterally flex your head (ear to shoulder) while retracting and depressing shoulder complex of the side being stretched. Hold the stretch for 1-2 seconds and repeat 5-10 times before switching sides. Upper Traps - Seated Active Isolated. 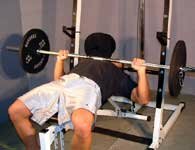 Sit on bench with two dumbbells. Position your feet straight-ahead and slowly lie on bench with proper posture (neutral spinal curvature). Position dumbbells perpendicular to ceiling (straight up). Brace the spine by drawing your navel towards the spine and squeezing the glutes. Pelvis should remain stable throughout the entire exercise. Slowly lower the weight, maintaining the wrist position over the elbows. Perform repetitions SLOWLY to enhance stabilization strength. Chest Press - On Bench With DB. 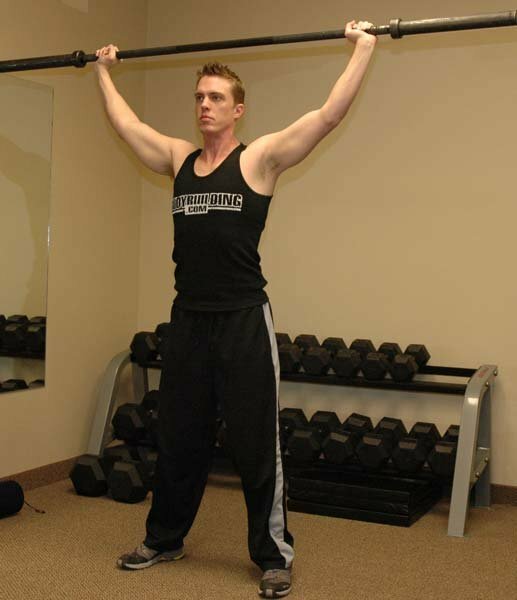 Place hands on pull-up bar with palms facing forward. Your grip width should be at least shoulder width apart with entire body hanging straight down. From the start position, draw your belly button inward toward your spine. Maintaining optimum spinal alignment, in a controlled manner, pull your body upward. The shoulder blades should move downward and in while the arms follow. Only move as far as you can control core stability and return to the start position. The return motion must include shoulder girdle upward rotation and elevation under CONTROL. Note: The return motion should be stopped just before the muscles relax. Do not allow head to 'jet' forward. Relax arms as much as possible, placing the emphasis on back muscles. Common mistakes to avoid: Raising the legs to help start the pulling motion, rotating the shoulders forward, hunching up the shoulders by the ears (indicating possible weakness in lower-mid shoulder girdle musculature), arching low back and rocking body. Maintain proper alignment through the kinetic chain by positioning the feet straight, glutes tight, 'neutral' spine angles, shoulder blades retracted and depressed, and chin tucked for good cervical alignment. Activate the core with a proper drawing in and pelvic floor contraction. 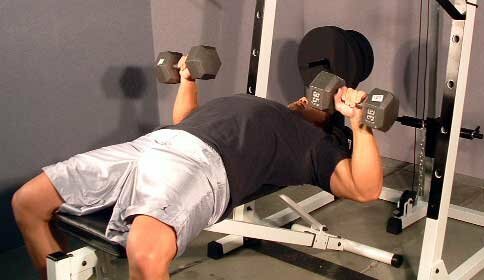 Choose light dumbbells and perfect the technique before moving to a heavier load. Lie prone with your lower abs / hips on the stability ball, feet against a wall and alignment described in the 'preparation'. With the dumbbells by your shoulders, perform a military press overhead and in line with the body. Keep the core and glutes tight to avoid lower back discomfort. Military Press - Prone On SB With DB. Stand on both legs with feet pointing straight ahead and knees slightly flexed. 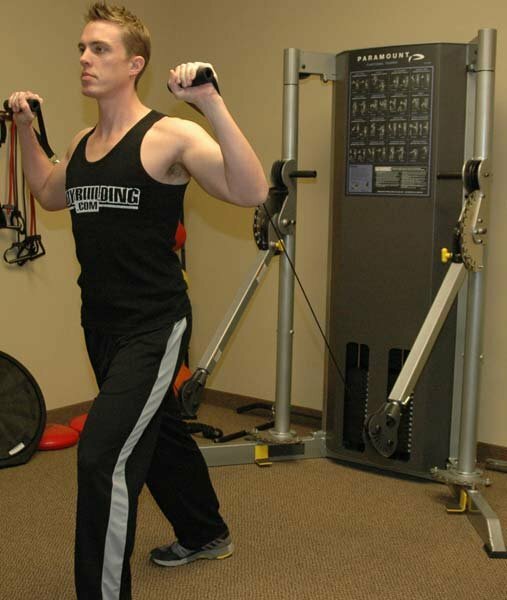 Maintain a drawn in position throughout the exercise. 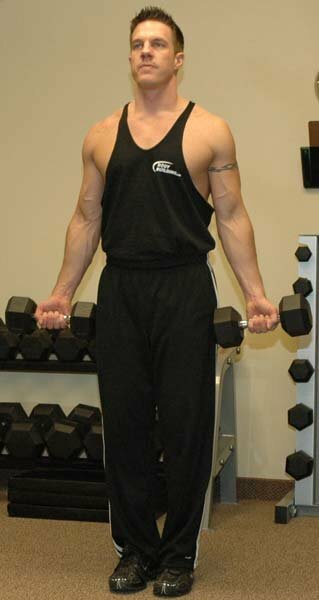 Hold a dumbbell in each hand with arms extended by side of body. 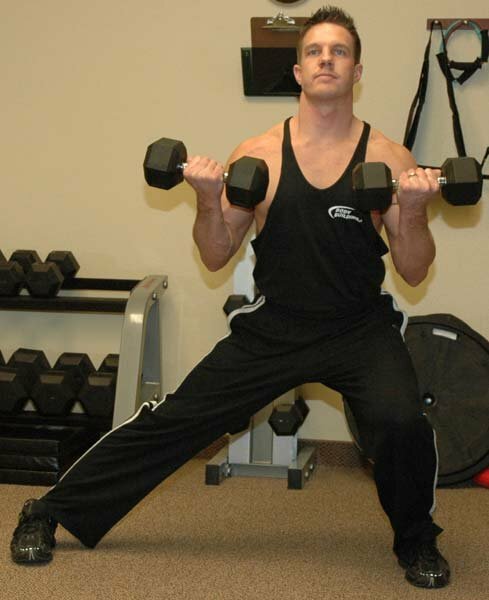 Maintaining level hips and the drawn in position, perform a bicep curl by flexing the elbow. Keep shoulder blades retracted throughout the exercise. 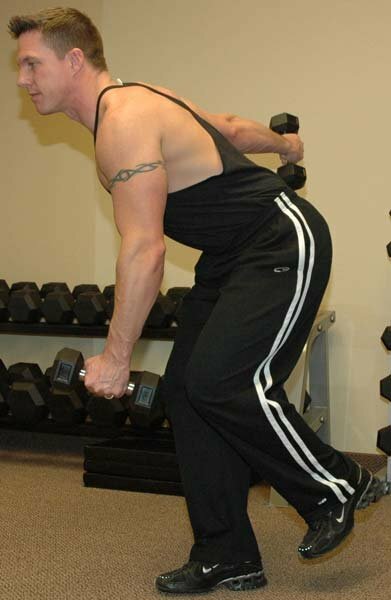 Slowly lower the dumbbells back to the side of the body by extending the elbow. Standing in proper posture, bend slightly forward at the hip (not the spine), with feet staggered for enhanced stability. Hands should be shoulder-width apart. Use a neutral grip or as close to neutral as possible. Maintaining spinal stability, slightly bend the knees to establish a stable stance. From the start position, draw your belly button inward toward your spine. While maintaining shoulder position, extend elbows (hands moving down and out to your sides) as far as you can maintain control. 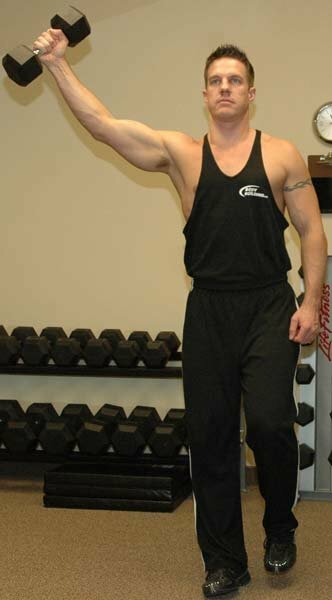 Using the triceps in a controlled manner, flex elbows (hands moving back toward shoulders) as far as can be controlled. Do not move the shoulders. All motion comes from elbows. Range of motion is determined by the ability to maintain tension on the triceps, not by how far the weight moves. Optimal postural alignment must be maintained throughout the entire movement. 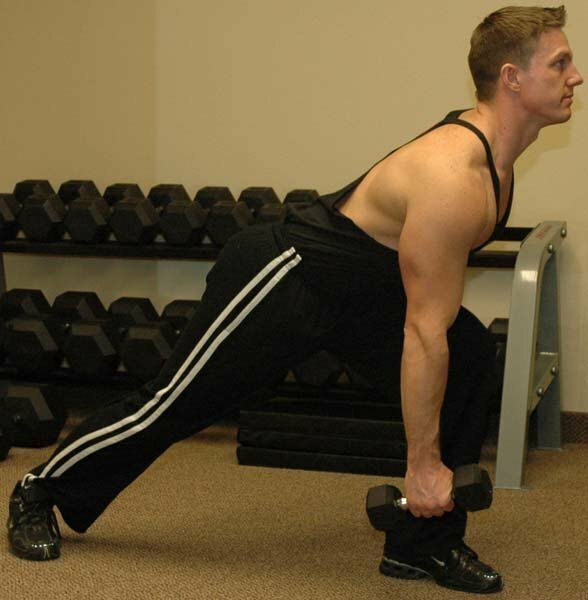 If your goal is triceps emphasis, maintain upper arm positioning. Avoid the tendency to 'unwind' at the end of extension (which occurs when the shoulder internally rotates as the elbow nears full extension), by maintaining body control throughout the extension phase. Progressions: Two extremities to one (1 arm). Feet may be placed around shoulder width or SLIGHTLY wider, with minimal external rotation. (NOTE: The wider the stance [abduction], the more external rotation of the feet is required to maintain alignment at the knees). Place bar comfortably on the upper back. DON'T BE AFRAID TO USE A BAR PAD! Maintaining tone in the deep abdominal musculature, descend slowly by bending at the knees and hips. During the descent, maintain weight distribution between the mid-foot and heels. Do not allow the feet to cave inward or shift outward. While maintaining tone in the lower abdomen and optimal kinetic chain alignment, 'drive' through the feet extending the ankle, knee and hip joints while your weight is evenly distributed between heels and mid-foot. Do not allow body weight to shift toward the toes. The knees should track over the second and third toe. Perform downward reps slowly and concentrate on the eccentric (descent) and the isometric (squat position) alignment of your body. Descend as far as you can control. 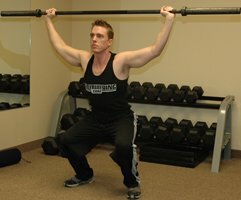 Partial squats should progress to full squats as neuromuscular efficiency improves. Squat - Back W/ Barbell. These programs are challenging, even the beginner routines. Until your body adapts to the new movements and the instability and compensates for it, these programs will remain challenging. After you have used one work out for six weeks, progress to the next level of difficulty; this could mean the next program, increased weight, increased repetitions and increased sets. There are many ways to progress in a work out. Just don't get stuck in a rut, change it up, add more weight- constantly challenging yourself is the way to lose the fat and stay totally conditioned all year round! Good luck with your fitness goals!